THE ADARNA+THE BAD KIDS – All members of The Adarna are very much into podcasts and documentaries. Particularly on the road. Members find you need something to break away from all the distortion and socializing and just get-your-education-on! It was on such an exploration that Andreka (lead guitarist for The Adarna) heard about Vonda Viland, the principal of Black Rock High School. An alternative high school in Yucca Yalley, California. Ms. Viland’s stance on no-child-gets-left-behind truly inspired all members of the band. 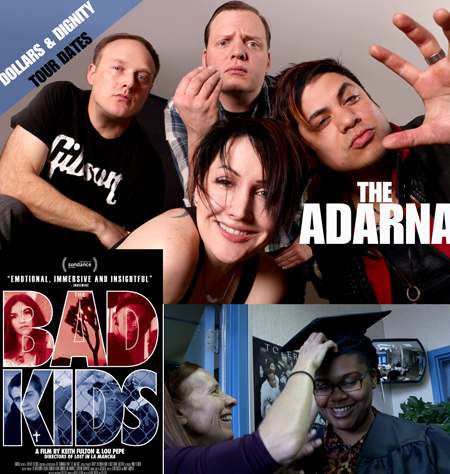 Viland’s story of her students living with abuse, neglect, parenthood, depression, anxiety, and addiction, is the topic of the award-winning documentary film The Bad Kids. Andreka herself is a graduate of an alternative high school in Seattle, and if it weren’t for her teachers and mentors having similar views as Viland, The Adarna itself would have been a very different story. In an email, when Andreka expressed to Ms. Viland how much the documentary resonated with her own story, she invited Andreka to speak to her students at the school. The only issue was the band is already confirmed to be on an aggressive tour schedule for their Dollars & Dignity Tour. However, in true Adarna-never-say-die fashion, and in-between a performance at Hollywood’s Viper Room and a performance in Tempe Arizona at Yucca Taproom that same day, the band will be making a special stop in the Mojave Desert to visit Ms. Viland, her students, and staff. On Tues May 16th, The Adarna will be performing a special acoustic performance for these “Bad Kids” who have stolen the heart of each member of The Adarna.